Pioneer announces its new flagship SACD player/DAC: the PD-70AE | What Hi-Fi? Some people revel in the vinyl revival. Some swear by streaming. Some enjoy nothing better than a good CD. Members of that last group, pay attention. 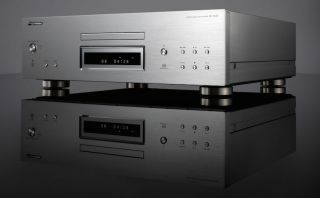 Pioneer has announced its new flagship SACD/CD player and digital-to-analogue converter, the PD-70AE. Its electrical innards include a full-balanced circuit featuring independent left and right channels, which the company says will help minimise interference when passing analogue signals through a balanced input. There are also custom electrolytic capacitors that also help provide higher-quality audio. For those who are particular about their audio tastes, right down to filters and lock ranges, the PD-70AE has a three-mode digital filter that can swap between ‘Slow’ (for soft and warm), ‘Sharp’ (for solid and tight) and ‘Short’ (for quick and forward) sound characteristics. You can also make fine adjustments to the digital-to-analogue converter's lock range in a six-increment scale. If this has suitably tickled your fancy, the PD-70AE is available in silver from November, priced at £2000.